The Nobel Prize has been awarded since 1901 for outstanding achievements in the fields of physics, chemistry, physiology or medicine, literature and for peace. In 1968, Sveriges Riksbank established The Sveriges Riksbank Prize in Economic Sciences in Memory of Alfred Nobel, founder of the Nobel Prize. The Nobel Prize is an international award administered annually by the Nobel Foundation in Stockholm, Sweden. Each prize consists of a medal, personal diploma, and a cash award. Alfred Nobel began the foundations for the prize in 1895, when in his last will he left much of his wealth for the establishment of this prize. Nobel was a scientist, inventor, entrepreneur, author and pacifist. He was born in Stockholm, Sweden, on October 21, 1833 and lived until 1896. His family genes tie him to Olof Rudbeck, the best-known technical genius in Sweden in the 17th century, at a time when Sweden was a great power in northern Europe. Nobel was fluent in many languages, wrote poetry and drama, and was also interested in social and peace-related issues, most of his views were considered radical for his time. Nobel’s father was forced to leave his home and his family in Sweden due to bankruptcy and head off to Russia in pursuit of a better life and employment. Once his father was able to afford it, he brought Alfred and his family to Russia. It was during his schooling in Russia that young Alfred, around the age of 17, blossomed. He studied in many countries and with many other great minds of the time. He found that when nitroglycerin, known to be explosive, was combined with an absorbent inert substance like kieselhugr (diatomaceous earth) it became safer to handle. Nobel patented this mixture in 1867 as dynamite. Nobel also owned Bofors, a major armaments manufacturer, which he helped redefine from its previous role as an iron and steel mill. His inventions and ownership of Bofors allowed him to amass great wealth in his lifetime. In Nobel’s will, he specified the designation of the Royal Swedish Academy of Sciences for the Nobel Prize in Physics and Chemistry. Annually the respective Nobel Committees send individual invitations to thousands of members of academies, university professors, and scientists from numerous countries, previous Nobel laureates, members of parliamentary assemblies and others, asking them to submit candidates for the Nobel Prize. The Royal Swedish Academy of Sciences then chooses from the names recommended. The Nobel Laureates receive the Nobel Prize in Stockholm on December 10th, in honor of the day Alfred Nobel passed. 2008: YOICHIRO NAMBU for the discovery of the mechanism of spontaneous broken symmetry in subatomic physics. And, MAKOTO KOBAYASHI and TOSHIHIDE MASKAWA for the discovery of the origin of the broken symmetry which predicts the existence of at least three families of quarks in nature. 2007: ALBERT FERT and PETER GRÜNBERG for the discovery of Giant Magneto resistance. 2006: JOHN C. MATHER and GEORGE C. SMOOT for their discovery of the blackbody form and anisotropy of the cosmic microwave background radiation. 2005: ROY J. GLAUBER for his contribution to the quantum theory of optical coherence. And, JOHN L. HALL and THEODOR W. HÄNSCH for their contributions to the development of laser-based precision spectroscopy, including the optical frequency comb technique. 2004: DAVID J. GROSS, H. DAVID POLITZER and FRANK WILCZEK for the discovery of asymptotic freedom in the theory of the strong interaction. 2003: ALEXEI A. ABRIKOSOV, VITALY L. GINZBURG and ANTHONY J. LEGGETT for pioneering contributions to the theory of superconductors and super fluids. 2002: RAYMOND DAVIS JR., and MASATOSHI KOSHIBA for pioneering contributions to astrophysics, in particular for the detection of cosmic neutrinos. And, RICCARDO GIACCONI for pioneering contributions to astrophysics, which have led to the discovery of cosmic X-ray sources. 2001: ERIC A. CORNELL, WOLFGANG KETTERLE and CARL E. WIEMAN for the achievement of Bose-Einstein condensation in dilute gases of alkali atoms, and for early fundamental studies of the properties of the condensates. 2000: ZHORES I. ALFEROV, and HERBERT KROEMER for developing semiconductor heterostructures used in high-speed- and opto-electronics. And, JACK ST. CLAIR KILBY for his part in the invention of the integrated circuit. 1999: GERARDUS 'T HOOFT, and MARTINUS J.G. VELTMAN for elucidating the quantum structure of electroweak interactions in physics. 1998: ROBERT B. LAUGHLIN, HORST L. STORMER and DANIEL C. TSUI for their discovery of a new form of quantum fluid with fractionally charged excitations. 1997: STEVEN CHU, CLAUDE COHEN-TANNOUDJI and WILLIAM D. PHILLIPS for development of methods to cool and trap atoms with laser light. 1996: DAVID M. LEE, DOUGLAS D. OSHEROFF and ROBERT C. RICHARDSON for their discovery of super fluidity in helium-3. 1995: The prize was awarded for pioneering experimental contributions to lepton physics, with one half to: MARTIN L. PERL for the discovery of the tau lepton. And the other half to: FREDERICK REINES for the detection of the neutrino. 1994: The prize was awarded for pioneering contributions to the development of neutron scattering techniques for studies of condensed matter to: BERTRAM N. BROCKHOUSE for the development of neutron spectroscopy . And, CLIFFORD G. SHULL for the development of the neutron diffraction technique. 1993: RUSSELL A. HULSE and JOSEPH H. TAYLOR JR. for the discovery of a new type of pulsar, a discovery that has opened up new possibilities for the study of gravitation. particular the multiwire proportional chamber. 1991: PIERRE-GILLES DE GENNES for discovering that methods developed for studying order phenomena in simple systems can be generalized to more complex forms of matter, in particular to liquid crystals and polymers. 1990: JEROME I. FRIEDMAN, HENRY W. KENDALL and RICHARD E. TAYLOR for their pioneering investigations concerning deep inelastic scattering of electrons on protons and bound neutrons, which have been of essential importance for the development of the quark model in particle physics. 1989: NORMAN F. RAMSEY for the invention of the separated oscillatory fields method and its use in the hydrogen maser and other atomic clocks. And, HANS G. DEHMELT and WOLFGANG PAUL for the development of the ion trap technique. 1988: LEON M. LEDERMAN, MELVIN SCHWARTZ and JACK STEINBERGER for the neutrino beam method and the demonstration of the doublet structure of the leptons through the discovery of the muon neutrino. 1987: J. GEORG BEDNORZ and K. ALEXANDER MÜLLER for their important breakthrough in the discovery of superconductivity in ceramic materials. 1986: ERNST RUSKA for his fundamental work in electron optics, and for the design of the first electron microscope. And, GERD BINNIG and HEINRICH ROHRER for their design of the scanning tunneling microscope. 1985: KLAUS VON KLITZING for the discovery of the quantized Hall effect. 1984: CARLO RUBBIA and SIMON VAN DER MEER for their decisive contributions to the large project, which led to the discovery of the field particles W and Z, communicators of weak interaction. 1983: SUBRAMANYAN CHANDRASEKHAR for his theoretical studies of the physical processes of importance to the structure and evolution of the stars. And, WILLIAM A. FOWLER for his theoretical and experimental studies of the nuclear reactions of importance in the formation of the chemical elements in the universe. 1982: KENNETH G. WILSON for his theory for critical phenomena in connection with phase transitions. 1981: NICOLAAS BLOEMBERGEN and ARTHUR L. SCHAWLOW for their contribution to the development of laser spectroscopy. And, KAI M. SIEGBAHN for his contribution to the development of high- resolution electron spectroscopy. 1980: JAMES W. CRONIN and VAL L. FITCH for the discovery of violations of fundamental symmetry principles in the decay of neutral K-mesons. 1979: SHELDON L. GLASHOW, ABDUS SALAM and STEVEN WEINBERG for their contributions to the theory of the unified weak and electromagnetic interaction between elementary particles, including inter alia the prediction of the weak neutral current. 1978: PYOTR LEONIDOVICH KAPITSA for his basic inventions and discoveries in the area of low-temperature physics. And, ARNO A. PENZIAS and ROBERT W. WILSON for their discovery of cosmic microwave background radiation. 1977: PHILIP W. ANDERSON, SIR NEVILL F. MOTT and JOHN H. VAN VLECK for their fundamental theoretical investigations of the electronic structure of magnetic and disordered systems. 1976: BURTON RICHTER and SAMUEL C. C. TING for their pioneering work in the discovery of a heavy elementary particle of a new kind. 1975: AAGE BOHR, BEN MOTTELSON and JAMES RAINWATER for the discovery of the connection between collective motion and particle motion in atomic nuclei and the development of the theory of the structure of the atomic nucleus based on this connection. 1974: SIR MARTIN RYLE and ANTONY HEWISH for their pioneering research in radio astrophysics Ryle for his observations and inventions, in particular of the aperture synthesis technique, and Hewish for his decisive role in the discovery of pulsars. 1973: LEO ESAKI and IVAR GIAEVER , for their experimental discoveries regarding tunneling phenomena in semiconductors and superconductors, respectively. And, BRIAN D. JOSEPHSON for his theoretical predictions of the properties of a super current through a tunnel barrier, in particular those phenomena which are generally known as the Josephson effects. 1972: JOHN BARDEEN, LEON N. COOPER and J. ROBERT SCHRIEFFER for their jointly developed theory of superconductivity, usually called the BCS-theory. 1971: DENNIS GABOR for his invention and development of the holographic method. 1970: HANNES ALFVÉN for fundamental work and discoveries in magneto-hydrodynamics with fruitful applications in different parts of plasma physics. And, LOUIS NÉEL for fundamental work and discoveries concerning antiferromagnetism and ferrimagnetism which have led to important applications in solid state physics. 1969: MURRAY GELL-MANN for his contributions and discoveries concerning the classification of elementary particles and their interactions. 1968: LUIS W. ALVAREZ for his decisive contributions to elementary particle physics, in particular the discovery of a large number of resonance states, made possible through his development of the technique of using hydrogen bubble chamber and data analysis. 1967: HANS ALBRECHT BETHE for his contributions to the theory of nuclear reactions, especially his discoveries concerning the energy production in stars. 1966: ALFRED KASTLER for the discovery and development of optical methods for studying hertzian resonances in atoms. 1965: SIN-ITIRO TOMONAGA, JULIAN SCHWINGER and RICHARD P. FEYNMAN for their fundamental work in quantum electrodynamics, with deep-ploughing consequences for the physics of elementary particles. 1964: CHARLES H. TOWNES, NICOLAY GENNADIYEVICH BASOV and ALEKSANDR MIKHAILOVICH PROKHOROV for fundamental work in the field of quantum electronics, which has led to the construction of oscillators and amplifiers based on the maser-laser principle. 1963: EUGENE P. WIGNER for his contributions to the theory of the atomic nucleus and the elementary particles, particularly through the discovery and application of fundamental symmetry principles. And, MARIA GOEPPERT-MAYER and J. HANS D. JENSEN for their discoveries concerning nuclear shell structure. 1962: LEV DAVIDOVICH LANDAU for his pioneering theories for condensed matter, especially liquid helium. 1961: ROBERT HOFSTADTER for his pioneering studies of electron scattering in atomic nuclei and for his thereby achieved discoveries concerning the structure of the nucleons. And, RUDOLF LUDWIG MÖSSBAUER for his researches concerning the resonance absorption of gamma radiation and his discovery in this connection of the effect which bears his name. 1960: DONALD A. GLASER for the invention of the bubble chamber. 1959: EMILIO GINO SEGRÈ and OWEN CHAMBERLAIN for their discovery of the antiproton. 1958: PAVEL ALEKSEYEVICH CHERENKOV , IL'JA MIKHAILOVICH FRANK and IGOR YEVGENYEVICH TAMM for the discovery and the interpretation of the Cherenkov effect. 1957: CHEN NING YANG and TSUNG-DAO LEE for their penetrating investigation of the so-called parity laws which has led to important discoveries regarding the elementary particles. 1956: WILLIAM SHOCKLEY, JOHN BARDEEN and WALTER HOUSER BRATTAIN for their researches on semiconductors and their discovery of the transistor effect. 1955: WILLIS EUGENE LAMB for his discoveries concerning the fine structure of the hydrogen spectrum. And, POLYKARP KUSCH for his precision determination of the magnetic moment of the electron. 1954: MAX BORN for his fundamental research in quantum mechanics, especially for his statistical interpretation of the wave function. And, WALTHER BOTHE for the coincidence method and his discoveries made therewith. 1953: FRITS (FREDERIK) ZERNIKE for his demonstration of the phase contrast method, especially for his invention of the phase contrast microscope. 1952: FELIX BLOCH and EDWARD MILLS PURCELL for their development of new methods for nuclear magnetic precision measurements and discoveries in connection therewith. 1951: SIR JOHN DOUGLAS COCKCROFT and ERNEST THOMAS SINTON WALTON for their pioneer work on the transmutation of atomic nuclei by artificially accelerated atomic particles. 1950: CECIL FRANK POWELL for his development of the photographic method of studying nuclear processes and his discoveries regarding mesons made with this method. 1949: HIDEKI YUKAWA for his prediction of the existence of mesons on the basis of theoretical work on nuclear forces. 1948: LORD PATRICK MAYNARD STUART BLACKETT for his development of the Wilson cloud chamber method, and his discoveries therewith in the fields of nuclear physics and cosmic radiation. 1947: SIR EDWARD VICTOR APPLETON for his investigations of the physics of the upper atmosphere especially for the discovery of the so-called Appleton layer. 1946: PERCY WILLIAMS BRIDGMAN for the invention of an apparatus to produce extremely high pressures, and for the discoveries he made therewith in the field of high pressure physics. 1945: WOLFGANG PAULI for the discovery of the Exclusion Principle, also called the Pauli Principle. 1944: ISIDOR ISAAC RABI for his resonance method for recording the magnetic properties of atomic nuclei. 1943: OTTO STERN for his contribution to the development of the molecular ray method and his discovery of the magnetic moment of the proton. 1942-1940: The prize money was allocated to the Main Fund (1/3) and to the Special Fund (2/3) of this prize section. 1939: ERNEST ORLANDO LAWRENCE for the invention and development of the cyclotron and for results obtained with it, especially with regard to artificial radioactive elements. 1938: ENRICO FERMI for his demonstrations of the existence of new radioactive elements produced by neutron irradiation, and for his related discovery of nuclear reactions brought about by slow neutrons. 1937: CLINTON JOSEPH DAVISSON and SIR GEORGE PAGET THOMSON for their experimental discovery of the diffraction of electrons by crystals. 1936: VICTOR FRANZ HESS for his discovery of cosmic radiation and CARL DAVID ANDERSON for his discovery of the positron. 1935: SIR JAMES CHADWICK for the discovery of the neutron. 1934: The prize money was allocated to the Main Fund (1/3) and to the Special Fund (2/3) of this prize section. 1933: ERWIN SCHRÖDINGER and PAUL ADRIEN MAURICE DIRAC for the discovery of new productive forms of atomic theory. 1932: WERNER HEISENBERG for the creation of quantum mechanics, the application of which has, inter alia, led to the discovery of the allotropic forms of hydrogen. 1931: The prize money was allocated to the Main Fund (1/3) and to the Special Fund (2/3) of this prize section. 1930: SIR CHANDRASEKHARA VENKATA RAMAN for his work on the scattering of light and for the discovery of the effect named after him. 1929: PRINCE LOUIS-VICTOR DE BROGLIE for his discovery of the wave nature of electrons. 1928: SIR OWEN WILLANS RICHARDSON for his work on the thermionic phenomenon and especially for the discovery of the law named after him. 1927: ARTHUR HOLLY COMPTON for his discovery of the effect named after him. And, CHARLES THOMSON REES WILSON for his method of making the paths of electrically charged particles visible by condensation of vapour. 1926: JEAN BAPTISTE PERRIN for his work on the discontinuous structure of matter, and especially for his discovery of sedimentation equilibrium. 1925: JAMES FRANCK and GUSTAV HERTZ for their discovery of the laws governing the impact of an electron upon an atom. 1924: KARL MANNE GEORG SIEGBAHN for his discoveries and research in the field of X-ray spectroscopy. 1923: ROBERT ANDREWS MILLIKAN for his work on the elementary charge of electricity and on the photoelectric effect. 1922: NIELS BOHR for his services in the investigation of the structure of atoms and of the radiation emanating from them. 1921: ALBERT EINSTEIN for his services to Theoretical Physics, and especially for his discovery of the law of the photoelectric effect. 1920: CHARLES EDOUARD GUILLAUME in recognition of the service he has rendered to precision measurements in Physics by his discovery of anomalies in nickel steel alloys. 1919: JOHANNES STARK for his discovery of the Doppler effect in canal rays and the splitting of spectral lines in electric fields. 1918: MAX KARL ERNST LUDWIG PLANCK in recognition of the services he rendered to the advancement of Physics by his discovery of energy quanta. 1917: CHARLES GLOVER BARKLA for his discovery of the characteristic Röntgen radiation of the elements. 1916: The prize money was allocated to the Special Fund of this prize section. 1915: SIR WILLIAM HENRY BRAGG and SIR WILLIAM LAWRENCE BRAGG for their services in the analysis of crystal structure by means of X-rays. 1914: MAX VON LAUE for his discovery of the diffraction of X-rays by crystals. 1913: HEIKE KAMERLINGH-ONNES for his investigations on the properties of matter at low temperatures which led, inter alia to the production of liquid helium. 1912: NILS GUSTAF DALÉN for his invention of automatic regulators for use in conjunction with gas accumulators for illuminating lighthouses and buoys. 1911: WILHELM WIEN for his discoveries regarding the laws governing the radiation of heat. 1910: JOHANNES DIDERIK VAN DER WAALS for his work on the equation of state for gases and liquids. 1909: GUGLIELMO MARCONI and CARL FERDINAND BRAUN in recognition of their contributions to the development of wireless telegraphy. 1908: GABRIEL LIPPMANN for his method of reproducing colours photographically based on the phenomenon of interference. 1907: ALBERT ABRAHAM MICHELSON for his optical precision instruments and the spectroscopic and metrological investigations carried out with their aid. 1906: SIR JOSEPH JOHN THOMSON in recognition of the great merits of his theoretical and experimental investigations on the conduction of electricity by gases. 1905: PHILIPP EDUARD ANTON LENARD for his work on cathode rays. 1904: LORD JOHN WILLIAM STRUTT RAYLEIGH for his investigations of the densities of the most important gases and for his discovery of argon in connection with these studies. 1903: ANTOINE HENRI BECQUEREL in recognition of the extraordinary services he has rendered by his discovery of spontaneous radioactivity. And, PIERRE CURIE and MARIE CURIE, née SKLODOWSKA in recognition of the extraordinary services they have rendered by their joint researches on the radiation phenomena discovered by Professor Henri Becquerel. 1902: HENDRIK ANTOON LORENTZ and PIETER ZEEMAN in recognition of the extraordinary service they rendered by their researches into the influence of magnetism upon radiation phenomena. 1901: WILHELM CONRAD RÖNTGEN in recognition of the extraordinary services he has rendered by the discovery of the remarkable rays subsequently named after him. The Nobel Prize in Physics has been awarded to 183 individuals since 1901. The map and graph below show the geographic distribution of Nobel Prize recipients. The United States has had 73 individuals win the Nobel Prize in Physics. The U.S. dominance results from generous funding for research from one of the world’s richest economies. The United States has government, industry, and philanthropic funding for their research, whereas most countries, like Australia, have only one source. The U.S. spends about 2.7 per cent of its gross domestic product (GDP) on research and development compared with only about 1.8 per cent in Europe and 1.3 per cent in China. "US set to continue dominance of science Nobel Prizes." Christian Today. October 4, 2007. 4 Dec 2008 . MacNeil/Lehrer Productions, 1999 Nobel Prizes . 2008. Online News Hour. 3 Dec 2008 . "The Nobel Prize." The Official Web Site of the Nobel Foundation. 3 Dec 2008 . 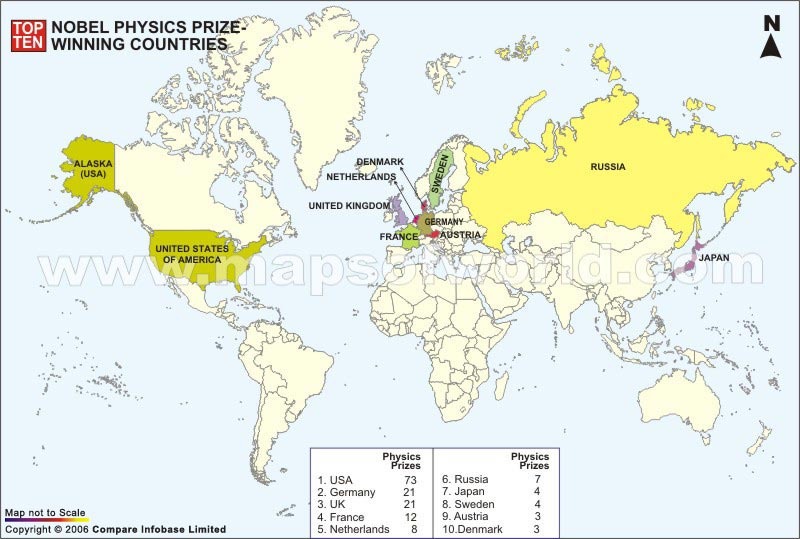 World Map Showing Top 10 Nobel Prize Winner Countries In Physics . Maps of The World. 3 Dec 2008 . Wu, Ona. "The Nobel Prize Internet Archive." Winners of the Nobel Prize in Physics. 2001. 3 Dec 2008 .
prof premraj pushpakaran writes -- 2018 marks the 100th birth year of Frederick Reines!!! prof premraj pushpakaran writes - 2018 marks the 100th birth year of Kai Manne Börje Siegbahn!! prof premraj pushpakaran writes -- 2018 marks the 100th birth year of Bertram Neville Brockhouse!!! prof premraj pushpakaran writes -- 2018 marks the 50th year of the invention of multiwire proportional chamber by Georges Charpak!!! prof premraj pushpakaran writes -- 2018 marks the 100th birth year of Martin Ryle!! !